On February 14, 1961 the Baltimore Colts gave up an undisclosed draft pick to the San Francisco 49ers for 34-year-old FB Joe Perry, who had spent 13 seasons with the 49ers going back to the All-America Football Conference. Perry was the NFL’s career rushing leader at the time with 7246 yards on 1451 carries, averaging just short of five yards per attempt. He had not come out of a major college football program, having gone into maritime service during World War II and thus playing service football and at Compton Junior College. He attracted the attention of the 49ers, then in the AAFC, and signed with them in 1948. An in-between runner at 6’0”, 200 pounds who lacked the power of a classic fullback or the outside finesse of a halfback, Perry nevertheless had great speed (hence his nickname “The Jet”). He shared the fullback job with Norm Standlee as a rookie, rushed for 562 yards, and topped the league in rushing touchdowns with 10. In ’49, he was the AAFC’s leading ground gainer with 783 yards while averaging 6.8 yards-per-carry. The 49ers moved to the NFL in 1950 and Perry remained their top ball carrier, and he was also an effective receiver out of the backfield on screen passes. The addition of HB Hugh McElhenny in 1952, a potent outside threat, made Perry even more effective and he was a Pro Bowl selection for the first of three straight seasons. He also led the NFL in rushing with 1018 and 1049 yards in 1953 and ’54, becoming the first back in league history to have thousand-yard totals in consecutive seasons, and he was a consensus first-team All-NFL choice after each of those years and received MVP recognition from UPI in 1954. The yardage totals were lower thereafter, although still solid and with high average gains, and Perry began to show some signs of wear, appearing in all 12 games only once more. He remained a key component of the offense until 1960, when he ran the ball just 36 times for 95 yards and a TD. San Francisco began jettisoning veteran talent in an effort to re-tool, ultimately including McElhenny and QB Y.A. Tittle, and the Colts were in the marketplace for a fullback. Baltimore had won back-to-back NFL titles in 1958 and ’59, and in addition to the passing of QB Johnny Unitas and outside ball-carrying and receiving of flashy HB Lenny Moore, FB Alan Ameche provided the power running between the tackles. However, an Achilles tendon injury that required surgery had sidelined Ameche during the 1960 season and, with his future in doubt (he would in fact be forced to retire), the Colts were in need of a replacement. The Colts dropped their last four games, missing out on a potential third straight title and finishing at 6-6, and the lack of a dependable inside running game was a key component in the collapse. 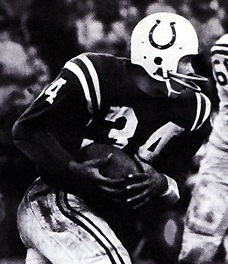 While there was skepticism initially as to how much Perry could resolve the problem at his age and lesser size, he did make an immediate impact in the opening game of the 1961 season when he rushed for 106 yards on 18 carries as the Colts came from 14 points behind to defeat the Rams 27-24. It proved to be his highest yardage total of the season, but he did compile two more hundred-yard efforts and provided reliability as well as a renewed durability and enthusiasm. For the year, he totaled 675 yards on 168 carries for a 4.0 average and three touchdowns. He also caught 34 passes for 322 yards, an average of 9.5 yards per reception, and scored another TD. Baltimore was better on offense (rising from eleventh in rushing yards to third), but problems on defense allowed for only a modest improvement to 8-6 for the year. Perry suffered a knee injury that required surgery during a 1962 preseason game but made a remarkable recovery to appear in 12 games for the Colts, running for 359 yards on 94 attempts (3.8 avg.) and pulling in 22 passes for 194 yards (8.8 avg.). While Perry reported to the Baltimore training camp for 1963, he was finally slowing down at age 36 and was released. He returned to the 49ers, where he was a backup in his final year (and was able to qualify for a player pension). Jim Brown surpassed Perry as the NFL’s career rushing leader in 1963, but Perry retired at number two with 8378 yards. Adding in his AAFC totals, he gained 9723 yards on 1929 carries (5.0 avg.) with 71 touchdowns, and compiled another 2021 yards on 260 pass receptions (7.8 avg.) and 12 more TDs. Perry was inducted into the Pro Football Hall of Fame in 1969.